Moisten half of the outer rim of 6 chilled coupes or martini glasses with the lime wedge and coat lightly with the peppery salt. 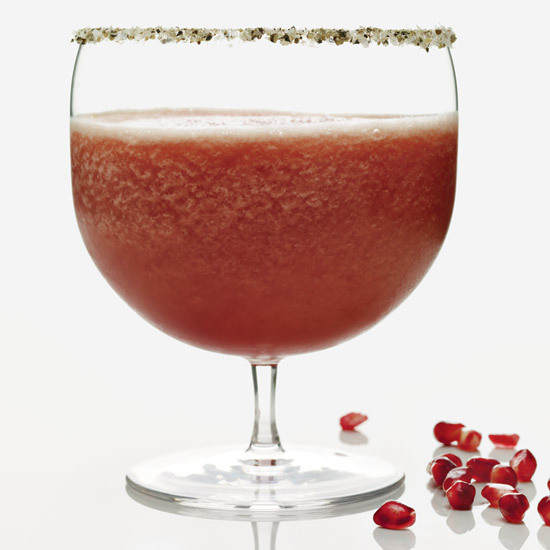 In a blender, combine the tequila, passion fruit puree, lime juice, pomegranate juice, blood orange juice, Simple Syrup and ice and blend until smooth. Pour the margarita into the glasses. Review Body: Very good. We used tajin instead for the salt rim. The drink didn't become frozen just watered down with the ice. So I just served over more ice and a bit more tequila. I also used agave instead of simple syrup. The flavor combo is very good. Will make again.